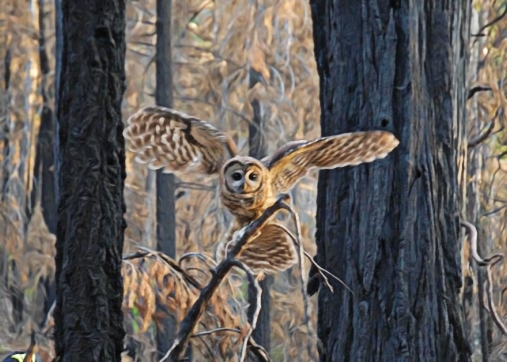 Wildlife ecologists studying the rare spotted owl in the forests of California have discovered that large, intense wildfires are not responsible for abandonment of breeding territories. Instead, the researchers found that post-fire logging operations, which are common on both private and National Forest lands, most likely caused declines in territory occupancy of this imperiled wildlife species. In the absence of post-fire logging, they found no significant effect of large forest fires on spotted owl territory occupancy. Post-fire logging damages important spotted owl foraging areas in “snag forest habitat” that is created by patches of intense fire. This habitat is rich in the small mammal prey species that the owls feed upon, but post-fire logging largely removes this habitat, thereby causing higher rates of territory abandonment. Post-fire salvage logging in the Rim fire area, California removed important spotted owl habitat. “This is good news for declining California spotted owls because this is something that we can control—we can make policy decisions to stop post-fire logging operations in spotted owl habitat,” said Dr. Chad Hanson, a research ecologist with the John Muir Project of Earth Island Institute, who is one of the study’s authors. The article was published this week in the peer-reviewed, open-access scientific journal Nature Conservation. Spotted Owl in a severely burned forest. The study sheds light on recent large fires, such as the 99,000-acre King fire of 2014 on the Eldorado National Forest in the Sierra Nevada Mountains. Spotted owl occupancy was reported to have declined in the King fire area, but the new study found that this was most likely due to post-fire logging. In addition, many of the spotted owl territories in the King fire which were previously described as lost due to the fire had in fact been unoccupied for years prior to the fire. 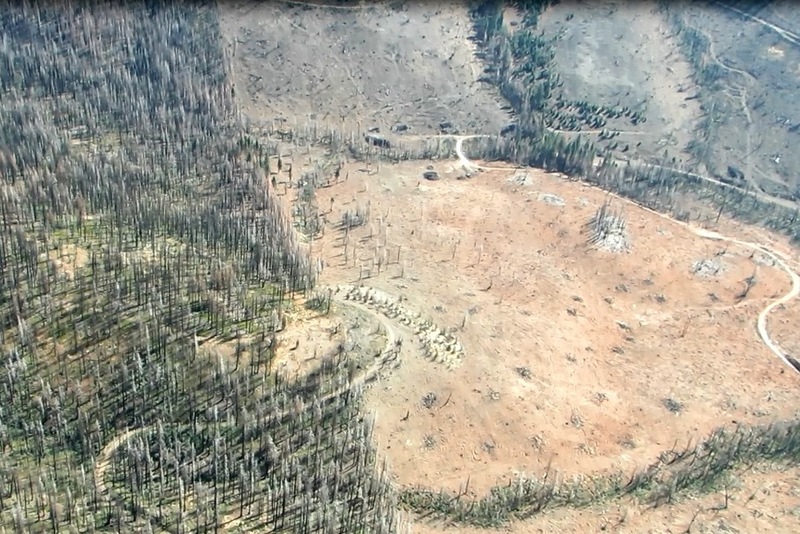 Aerial view of post-fire logging in Rim Fire area, California. 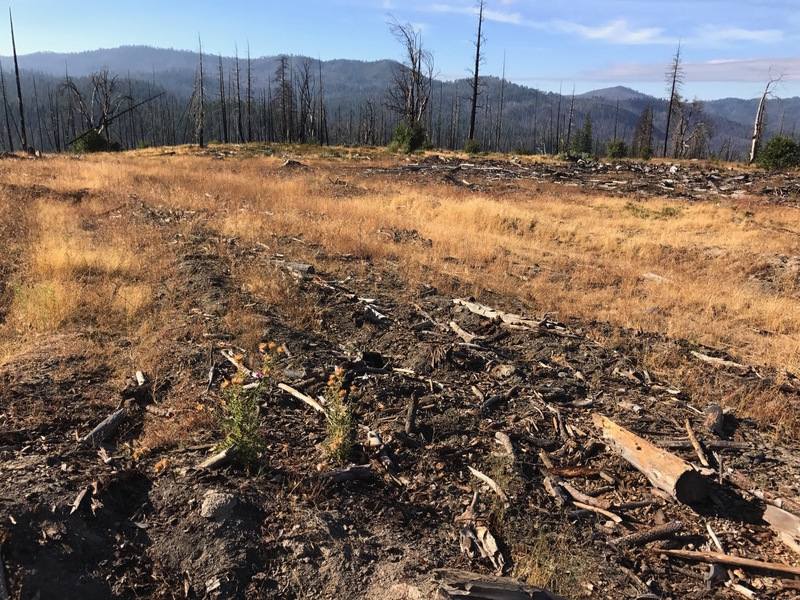 The study’s results coincide with the strong consensus among hundreds of U.S. scientists opposing post-fire logging operations due to a wide range of ecological harms. Pro-logging members of the U.S. Congress have recently pointed to large forest fires as a justification for proposed logging bills that would override most environmental laws and dramatically increase logging, including post-fire logging, on U.S. National Forests and other public lands. The results of this study indicate that such legislative proposals would be contrary to science, and harmful to spotted owls. Other studies also indicate that increased logging would substantially reduce forest carbon storage, and increase greenhouse gas emissions, exacerbating climate change.